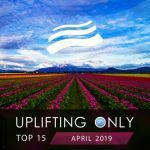 Time for this month's Uplifting Only Top 15 compilation. Again, Ori has personally hand-picked 15 of the very best tracks from recent episodes of his Uplifting Only radioshow/podcast, and here they are! The definitive show for orchestral uplifting trance, Uplifting Only airs on 43 radio stations around the world and has been named the #6 and #8 trance radio show in the 2015 and 2014 Trance Podium Awards. This edition of the monthly compilation features music from Kelly Andrew, Ahmed Romel, Afternova, SoundLift, illitheas, Mhammed El Alami, Manuel Rocca, Syntouch, InnerSync, Mart Sine, Emanuele Congeddu, Nikolauss, Amir Hussain, Aftermorning, Mike Sanders, Sam Vince, Aylin, Samantha Star, Aldo Henrycho, The Cloudy Day, and many more!